So what's the deal with Ang Lee's HULK? I mean it wasn't that bad......ok maybe It was, but who cares? Now there's a new Hulk and this one's not as bright green nor are his pants purple. Edward Norton replaces Eric Bana(whom I consider to be much more awesome) as Bruce Banner and Liv Tyler replaces Jennifer Connelly as Betty Ross(Connelly being about 23 times more attractive). These two lead a pretty good cast, and deliver an overall satisfactory performance. 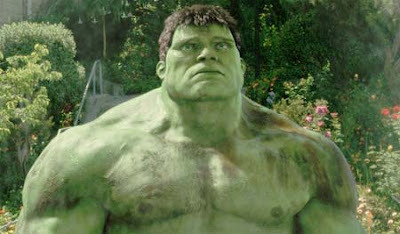 Still the star of the movie is the Hulk himself, and truth be told I'm a bit conflicted. I liked Ang Lee's Hulk, or rather Industrial Lights and Magic's Hulk, I thought he was really well animated and his facial expressions in particular were very impressive, who cares about the skin color that resembles Nickelodeon ooze and the purple pants are not realistic, I mean come on, we're talking about a dude that turns green and becomes a giant when he gets angry. But Rhythm and Hue's Hulk(the new one) is really quite good too, he's animated in a very "realistic" way, meaning that he looks like he actually weighs what a giant would and he moves for the most part in a non cartoony way. There's a particular scene that I really liked where you can see Hulk's skin cracked near his shoulder right after you see bullets bounce off his skin that made me the graphics whore inside of me say "COOL!" Overall I'd have to give the nod to Rhythm and Hue's Hulk because unlike the previous movie they decided to show the Hulk for the most part in only dark settings where the sun could not make it look too unreal, and the one scene that was in the daylight was shot with crazy fast camera angles that also hid the "unrealness" of the hulk for the most part. Now the reason why this film was made was because Ang Lee's lacked action, it was too "cerebral" Is the word most of the internet uses to condescendingly describe the film. In this sene The Incredible Hulk delivers, this film is short on back story and feelings and heavy on action, that's not to say that we don't see how Bruce feels about his situation but the movie doesn't emphazise on that too much. There's even a return of the "HULK SMASH!!!" line which I have to admit occured in a really REALLLY corny way. But the action scenes deliver, we get to see the Hulk take on the army a couple of times in different settings and even take on some sort of cloverfield-monster-only-a-baby-version-lookalike with pretty awesome results. Still at the end of the movie you get the feeling this was just the exposition of the story and there's gonna no doubt be a sequel, a trend I'm starting to really dislike. Overall, the Incredible Hulk is good. Go see it. But see it in the afternoon when it's not 8 bucks, it's not really worth 8 bucks....Meaning it's not Iron Man Caliber, but then again what is? ?